If you read the drug information included with any medication a doctor prescribes for you, there is usually a long list of possible side effects, including some that make you wonder if taking the medication is worth the risk. In recent years, anti-depressants have come under attack for their overuse for various disorders and associated risks in various groups. 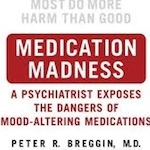 Jason Hartman interviews psychiatrist, Dr. Peter Breggin about how pharmaceutical companies have promoted that depression and anxiety attacks and many other mental disorders and illnesses are based on chemical imbalances and that this pill or that pill will take care of the problem. For details, listen at: www.HolisticSurvival.com.